With a bold cheesy flavor and a spicy kick, it’s hard to believe this queso dip has 0 Points. But joy to the world…it does. And by the way, did I mention that you can eat the WHOLE JAR for 5 Points!??!? Oh Em Gee. I’m in love. The nutritional information on this dip is beyond amazing….take a look…. So run…don’t walk to your nearest Trader Joe’s and pick some up, ASAP! So, here’s the thing about 0+ point foods… you have to be careful that you only have ONE serving because if you add up the values on more than one serving, then you accumulate points. I’ve made this mistake with other foods and let’s be honest – I don’t think I could be happy with just 2 Tbsp of Queso – I’m a total cheese head! 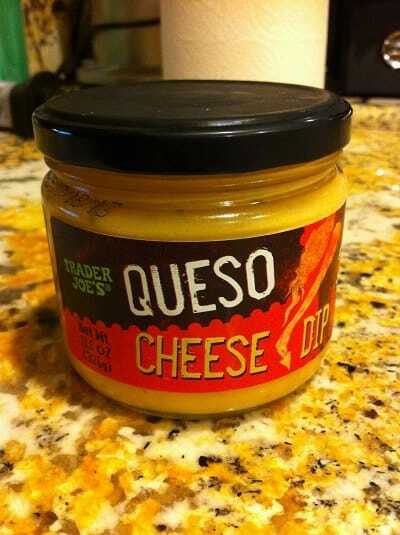 But good to know that there is still a low point queso available out there! Thanks for sharing! it’s five points for the whole jar. We don’t have a Trader Joe’s in my area. Can you order this online? BillieJo, I don’t think there’s anywhere you can order Trader Joe’s products online :(. But maybe you have a friend or family member near a Trader Joe’s who can pick some up and mail it to you? Good luck! Love queso, so thank you!!! But can you suggest exactly what we can dip into it that’s not soooooo bad for us? Other than tiny tiny tiny bits of the tortilla chips, or is there something else out there you can suggest to get our queso fix. LOVE you site, by the way, and thank you for it and all the great recipes! Helena, try some veggies like bell peppers, cucumbers or sugar snap peas! Buy some of those high fiber whole wheat La Tortilla factory tortillas, bake them in the oven to make your own chips. I just went to Trader Joes for the first time to get this 0 point cheese dip. I haven’t opened it yet, but I am loving trader joes!!!! OMG! I did pass it up on my last trip to TJ’s. I saw it and almost picked it up, but decided to pass…thinking it wouldn’t be points friendly. I’m so going back, HAHA! I did put my finger in to at least get a taste (hoping to not ingest glass bits). Seemed delicious. Now have to try and get back to the store; unfortunately, not real convenient. GRRRRRRRRRRRRRRRRRRR darn cat. what is in it?? it creeps me out a little not gonna lie. Haha, I was wondering the same thing!! Does Trader Joe’s have a website so I can have some too? I’ll have to check that out! NEED QUESO! I agree completely OH MEE GEEE!!! That’s sooooo exciting, thanks for letting the world know about this stuff, esp. since its game time!